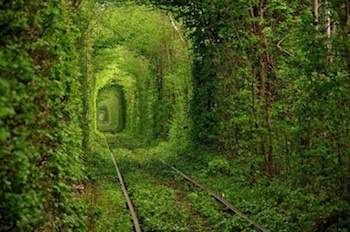 The Progressive BPO Train has left the Station - is IBM on it? Since the divestment of its voice business to Concentrix, IBM’s medium-term strategy with its BPO business lines has been squarely under the microscope. 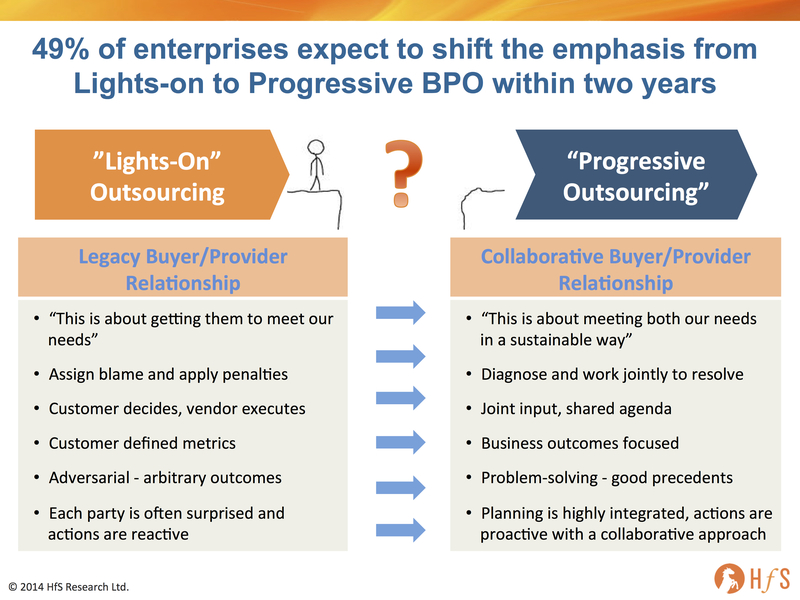 From our standpoint at HfS, it's abundantly clear that an ambitious 49% of enterprise BPO clients are shifting towards a two-pronged requirement of both operational and transformational (what HfS terms as “Progressive”) service needs. With this in mind, is Ginni Rommety's revamped IBM corporate strategy geared towards the firm's long-term success as a BPO provider? IBM has been evaluating areas of its business where it may be losing its competitive edge and/or profit margins are simply getting too squeezed, which explains its other recent sell-off of its x86 server business to Lenovo. Two years into the job, it is clear that Ginni is focusing on high-margin cloud software, analytics and services, as opposed to commodity computing and storage. So if the cheap, low-margin businesses are becoming no-goers for the firm, where does this leave their BPO business, which has grown up on the transactional, highly scaled and fungible, low-wage employee model? The winning BPO providers in today’s market are those which have proven credentials to run standard business services at competitive prices, with the business transformation, analytical and IT enablement capability to take ambitious clients to new thresholds of value. Not dissimilar to the development of the IT outsourcing business over the past two decades, the capability to run the standard operations for clients has become commoditized at increasingly low-margins, while the higher margin work lies with the integration and consulting areas, tied to those outsourced operations. However, the major distinction between BPO and ITO that we, at HfS, are seeing with maturing BPO delivery is that it simply is not as easy to separate the “transactional” from the “higher value, progressive activities”. Simply put, if you outsource your cash apps, invoice processing, collections and general ledger consolidation operations to one provider, it is nigh-on impossible to bring in another provider to run financial planning and analysis, auditing, treasury, risk compliance activities, if that second provider does not have an institutional knowledge of your ground-up bread and butter processes. Can providers like IBM prosper in BPO if they sell-off their lower-margin operation services? Hence, the big question for IBM is whether the firm will continue to invest in its "Lights On" BPO business lines in order to profit from the higher value fruits on offer with the "Progressive" business and IT needs of maturing BPO clients. With its key top tier BPO rivals, namely Accenture, Capgemini and Genpact, clearly moving along this two-pronged path of operational and transformational delivery, IBM needs to demonstrate a similar commitment to the BPO industry. Clearly, IBM wants to deliver cloud software, consulting and integration services in HR, finance, supply chain and marketing areas where it can reap the rewards of the tastier margins, but HfS is concerned those incumbent providers of the BPO operations will get first bite at the higher-margin cherry. At HfS we are already witnessing management consultants increasingly competing head-on with service providers in progressive service areas where the client requirements are moving from an “as is” lift and shift of services to a “to be” roadmap of where the company expects to be in the next two-to-three years. So where does this leave IBM BPO business, when it's not appearing fully-focused and its competitors are throwing the kitchen sink at the space? Analytics. The IBM story on analytics is as good as anything we hear today in the marketplace, especially with the billion-dollar investments IBM has made in analytics technology and tools over the last 5 years. It also topped the service provider market for innovation in the recent HfS analytics blueprint assessment. However, many of these analytics deals grow incrementally from relationships where there is deep-rooted operational delivery (i.e. start small and grow over time). With all of IBM's prime competitors offering analytics capabilities that are tied to the operational model, it's clear that shedding process work will harm future growth opportunities. Industry and Functional Acumen. Like some of the other BPO providers that are integrated into consulting led organizations with deep industry practices, IBM BPO has access to owned (and borrowed) resources to a breadth of industry process knowledge that is a critical building block to solutioning for the world of Progressive BPO. The firm also has added organization scientists and data assets through the Kenexa acquisition that bring deep and differentiated functional expertise as well. However, a recent visit to the IBM BPO website (see link) surprised us when we observed so many offerings including in the Concentrix sell-off which, although having voice components, are not predominately voice-based, namely Health Administration, Insurance, Public Sector and Banking (outside of Lending) services, where visitors are all redirected to the Concentrix website. This makes us further question IBM’s commitment to the market for the medium term, as the Concentrix sell off was clearly more than solely the call center services that it had originally led analysts to believe. Technology Platforms. IBM has access to a great breadth of software tools and applications, which can be built into BPO solutions. Although many of these tools are also used by other BPO providers under license, it is the opportunity to build broad industry and functional solutions around them that could be one of the leading differentiators for IBM. Given IBM’s research capabilities and the right commitment, this could be the way to cross the chasm faster than its competition. HfS would particularly like to see progress/performance in integration amongst the different assets and approaches, however, such as how employee self-service interfaces and adoption for areas such as HR and travel and expense are factored into overall workforce productivity that ultimately impact business results. In addition, there are several tremendous technology acquisitions that are noticeably absent from its BPO dialog, such as Sterling Commerce and Emptoris. Does this mean IBM really wants to be the systems integration provider for technology, as opposed to the business services provider for operations, enabled by technology. Process Automation. IBM has its own solution for the emerging area of robotic process automation (an area we at HfS love to talk about at the moment) in Blueworks Live. Like other tools for this automation, we’re looking for the first broad reference client case studies but this is certainly a step in the right direction. IBM has been a core part of this business since it picked up PwC's BPO operations in 2002 and has placed itself at the forefront of core business services markets such as F&A, Procurement and Analytics. Its technology prowess, massive client base and global scale put the firm in a tremendous position to dominate for years to come, but the recent gray clouds hovering over the firm are raising doubts as to its future direction. Simply put, clients’ needs are maturing and they are demanding results faster than ever – they want providers who understand their business model and are not afraid to roll their sleeves up to progress them to new levels of productivity. If IBM is moving away from delivering lower-margin operations (i.e. the “lights-on” services), surely it will be at a major disadvantage when it comes to winning the higher-value (progressive) work. Hence, HfS would have major concerns about its positioning for Progressive BPO services, were IBM to seek to sell off the lower-margin elements of its F&A, Procurement or HR businesses, like it has with its customer services BPO business. So far, we have no indication that this is the firm’s intention, but a more concise statement of intent from Rometty and a definitive business services roadmap would be welcome. Excellent, balanced article. You highlight where IBM needs to firm up their strategy, and discuss their strengths, challenges and opportunities. Well thought through - and very accurate. Super analysis. IBM has been sitting on the fence for some time now with BPO and I agree that the Concentrix sale asks several important questions of IBM's future plans for the space. I think they are much more invested in F&A than they ever were in call center and will stick with the plan, but some reassurances from leadership would be welcome! Great article. I think IBM is in a strange place right now as they figure out where to go. While it's great to follow the Cloud and to follow Big Data and Watson, they also need to consider the business processes and operations. The next few months will be pivotal for the firm. IBM's strategy is clear. Sell no services that cannot be eliminated or made smarter without technology. Selling its call center business is the result of Big Blue realizing that Watson, no matter how interesting, cannot automate a call center, and they have no other software to sell in this area. The question is what they'll do in Proc and F&A. Neither can be automated, though Electronic invoicing can do away with AP. I suspect we'll see something for sale, but Accenture's purchase of Procurian for such a rich sum means that few companies have the scale to buy these units from Blue. @Tony - and there lies the problem - maybe in 5-10 years the top service providers will only be delivering high-margin analytics and technology platforms and services, but the journey to get there is only now starting at a faster clip. Right now, there is a land-grab for F&A / Procurement / Other BPO operational work that needs transformation. This isn't the time to exit the market - it's time to invest in it. What is interesting are the deals we are starting to see switch from the body-shop providers to those providers that can offer some transformation, however all those deals are a combo of transactional ops and higher value analytics / process transformation and tech enablement. In addition, let's not ignore the robotic automation potential in F&A and other ops, where the tech players can get ahead by robotizing processes, such as AP and order management. An interesting piece. But the same age-old problem remains. Lights-on outsourcing is an interesting and new euphemism invented to describe BPO's failure to deliver the original transformational outsourcing. Progressive outsourcing equates to good, old BTO, with its emphasis on business outcomes. Question, then. How do we evaluate the business outcomes of the progressive/transformational outsourcing piece? I've tried examining this using a few financial algorithms wrapped around finance (working capital, OCF and FCF) and HR (various productivity measures). In all cases, even the big GBS deals, providers come up short. Nothing. Nada. Not even a blip on the radar. Is this why IBM are exiting stage left? You are quite right, Phil. Theirs is indeed a high margin oriented strategy. And BPO, even in its BTO guise, isn't gaining traction. @Ant - great to hear from you old chap! The old HRO paradigm was really about selling the transformation to improve the employee experience with the advent of the Internet. Oh, and providers were doing it and saving clients' some money at the same time. Sadly, that all came down with the dot.com crash and is only really coming back now as a much more operational proposition based on payroll / employee call centers, ben admin and RPO. What's different with ITO and FAO is that their whole initial premise was/is/will be for some time to come based on labor arbitrage and ultimately sponsored from the CFO's office. Clients are shedding bloated labor costs before holding their hands up and demanding "value". However, doing a lift and shift doesn't necessarily leave a client in a bad position - they actually are well geared to evaluate some form - or forms - of transformation. And that is where many clients find themselves today - in a state of standard operational mediocrity and looking for the "what's next?". This is what "Progressive" is all about - helping clients improve their talent and technology to find new sources of value. It's all about which vendors are in the best position to be the "Progressive" provider - and is it the incumbent that's running the standard operations, or a new provider which can add transformational capability. IT is very operational, and it's clear clients can employ an integrator do to the higher value work, while the lower cost vendor can stay saddled with the table-stakes support work. FAO / Procurement / BFS / Healthcare / Marketing BPO is very different - it's hard to separate the operational from the transformational, hence those vendors that actively avoid the arbitrage deals may be out of the game altogether... it's a BPO land-grab! One recent trend I am seeing is with some clients wanting more value and simply running their contracts down to switch providers - it's almost taking the "lift and shift" and "shifting" to another provider with the expectation that they will achieve more value beyond the table stakes. Phil - couldn't agree more with this piece. IBM's obsession with profitability is taking them into strange places. If they want out of BPO, then fine, but they need to be clearer about their intentions. However, as Tony points out, the Procurian price tag may have scared off some suitors for larger BPO purchases. Thanks for the response Phil. Yes, the 'old chap' reference is an apposite one: I can remember back in the early 00's white papers from the major BTO providers being entirely explicit about enterprise level transformation through outsourcing. Significantly, the claim was such transformation would be felt at enterprise level - in increased revenues, market share, etc. These were heady days for the outsourcing industry and it attracted my academic interest because BPO, and especially BTO, represented where state of the art thinking about strategy, finance and leadership all converged in organisational settings. Well, at least in theory! Moreover, I can also remember at least two companies, each beginning with B, who at the time had phenomenally innovative leadership teams who understood what transformation meant and outsourcing's role in helping them to achieve that. Some of the financial analysis I was conducting in the late 00's (and there's been precious little since) clearly revealed an enterprise level impact, and you could even track it when comparing the performance of service providers against SSC's and (then conventional) internal delivery. These days are long gone. Or at least they appear to be when I see, 15 years later, we are now writing about how we are still waiting for the move to "progressive" approaches which have, among other things, business outcomes as their focus. I can't comment on IBM's strategy, as I'm no closer to it than anybody else on the outside reading their material. But if clients are focused solely on getting headcount and back office costs under control, the path to what you describe as "progressive" outsourcing and enterprise level results for clients is nigh on impossible. The original goal was to touch those metrics which ultimately mattered. If I could get my procurement and F&A under control, it would have had direct impact on my working capital and my CAPEX, which would in turn have driven my OCF, which ultimately would have fed into higher FCF, which provided leadership teams with enterprise level strategic choices about how to invest and operationally compound future performance gains or reward investors. That was the plan fifteen years ago. And now? Progressive constitutes asking, "what's next?" after headcount reduction and labor arbitrage. In analyst speak, it's immaterial. Time for a re-think. @Ant - a very thoughtful paragraph and brought me back to the earlier premise of BPO just before the dot.com crash! I think what BPO - and ITO - have managed to achieve is the separation of the "routine operations" from the genuine high value contributions that HR, finance, procurement etc can make to the business. Outsourcing is the great exposure activity for firms - and is often the first major exercise many have undertaken that truly evaluates their processes, operations, technology and talent. When I worked as an advisor, we made more money simply documenting and breaking down clients' processes and workflows than anything else - because they had never done it. How can clients even think about "transformation" when they haven't even evaluated their own backbone and how it is stitched together and functions? While we can bash several providers for over-promising their capabilities, it was abundantly clear than most clients simply did not have the talent, the desire to change, access to meaningful data, or integrated ERP backbone to even get started on a genuine "transformation". The reality was simply that CFOs didn't want (and still do not want) to invest tens/hundreds of millions on transformation projects to have world class HR, IT or Finance, but many were prepared to have a provider have a crack at some transformation, if it actually saved them money and improved productivity. And that premise hasn't changed. Highly functional labor arbitrage. The leading providers today do arbitrage very well - it's where they make their margins and where they tend not to screw up. They're much better at it today than even five years' ago. Outsourcing done right does save money - at least for a few years. Cloud-based platforms. This is making it feasible for clients to access their systems and data globally and making it so much easier for providers to deploy common standards and workflows across their clients' orgs. This has really developed just in the last three years and have a lot more runway to come as better platforms are enabled and reliance on legacy systems and ERP decreases. Analytics. More streamlined technology enables the ability to get better access to data. Most clients do not have the tools or skillsets to develop competent analytics capabilities on their own. Some providers are already helping their clients in major ways here, but most still have a long way to go. Automation. Do not underestimate the value of automating processes, and, like analytics, we are just starting to see the value or eliminating tasks and fixing broken processes in areas that were very hard to automate in the past. Automation may well prove the key in decreasing the reliance on linear FTE-based pricing in the future. Talent deficiency realization. Probably the most important shift has been clients slowly discovering they simply do not have the right mix of skills to improve their back office capabilities. They need to create environments where they can start to develop/acquire the talent they need. The outsourcing experience often accelerates this realization for clients and forces change a lot faster. This doesn't necessarily mean all providers are delivering the talent they need (which is the main cause of dissatisfaction the provider ejections today), but it does mean that clients know they need to address their people, along with their processes and technology. Transformation ultimately comes from within - the right providers really just create the environment to transform. So while I sympathize with your frustrations with the earlier premises of much-failed "transformation", what really was happening was that many enterprises were just embarking on a much longer journey. We're only arriving now at a critical juncture where clients are genuinely staring down the "transformation barrel" and realizing they have to get on the train, or they will fail. These are 5/10/15 year journeys for most orgs - and most who want to genuinely transform have only just started. Companies wanting to make the leap to "Progressive" outsourcing should look into the University of Tennessee's award winning research and step-by-step Vested Outsourcing methodology which teaches HOW to create truly transformational "Vested" relationships. For those not familiar with Vested - UT researchers have 5 books on the topic (all available on Amazon) and offer some fabulous courses (Executive Education and online courses) that are well worth looking into. I really agree with Kate VItasek's view on award winning research and step-by-step Vested outsourcing methodology by the University of Tennessee.